The hundreds of choices we make each day impact the environment. Sometimes it's a big decision....sometimes its as small as changing your toothbrush. 24K Organic strives to keep this world a better place! Plastic Toothbrushes can take hundreds of years to properly decompose 7 can even leak pollutants into the surrounding soil and water, causing animals to die each year. Our Natural Bamboo Toothbrush decomposes within a year, are BPA free, and cruelty free to animals. 24K strives to keep this world clean, healthy, & safe. Go Green With This Nontoxic Dental Care That's Safe For The Entire Family! 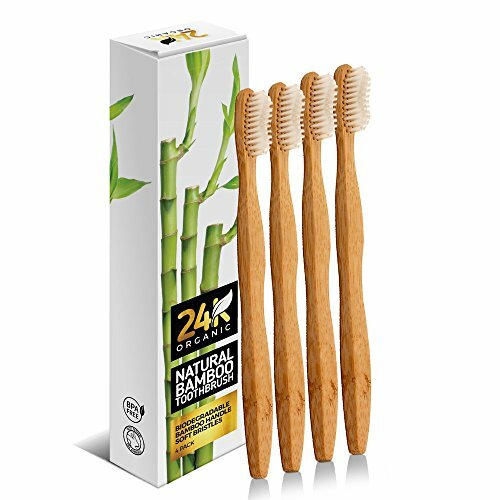 YOU CAN MAKE A DIFFERENCE - These Natural Bamboo Toothbrushes Are A Great Way To Help Keep The Earth Green. Keep All Those Plastic Toothbrushes Out Of The Oceans And Landfills By Getting These Eco Friendly Dental Care For The Entire Family. GO GREEN - Natural Bamboo Toothbrush By 24k Organic Strives To Make An Impact In The Word. Hundreds Of Whales, Fish, & Animals Are Killed Each Year Due To Toxic Waste. The Bamboo Brush Is Natural And Will Provide You With The Ultimate Tooth Care! SUPERIOR CLEAN - You Can Treat This Toothbrush Like Any Other. There Are Added Benefits. Bamboo Is Actually Healthier Than Plastic, Its Water Resistant, Harder Than Wood, And Splinter Free. EFFECTIVE CLEAN - With Its Unique Design The Soft Bristles Are Completely Soft On Gums And Helps Clean Your Mouth Effectively. SAFE FOR THE ENTIRE FAMILY - We've Not Only Found An Environmentally Better Way To Brush, But We've Done So Keeping The Integrity Of A Well Known Design. These Bamboo Toothbrushes Will Impress Mother Nature! These Brush Heads Are BPA Free & Is Safe For Men Woman Children And Toddlers! If you have any questions about this product by 24kOrganic, contact us by completing and submitting the form below. If you are looking for a specif part number, please include it with your message.